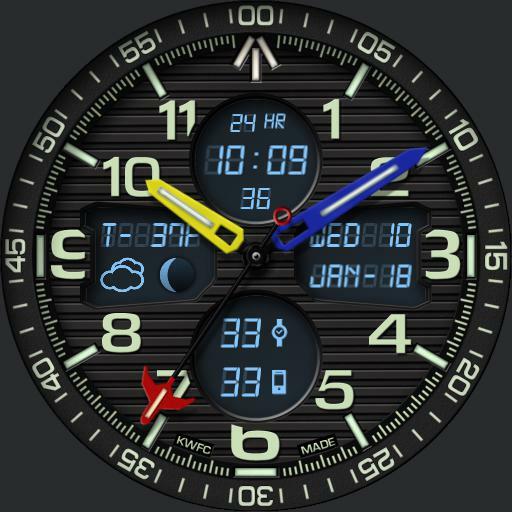 Tap Date panel to cycle dial colors. Tap between 7 - 8 area to zoom. Tap between 4 - 5 area to park hands. Tap Top Time panel to cycle modes. In stopwatch mode tap between 10 - 11 area to start/stop and between 1 - 2 area to reset. Tap Bottom Battery panel to cycle between date or steps/heart rate mode on date panel, and Battery or Compass mode on bottom panel. Tap Left Weather panel to cycle weather functions. Tap Center to open dim mode menu. Tap mode text to cycle modes - On Normal, Always On, Auto Always On or Off. Tap X to close menu.